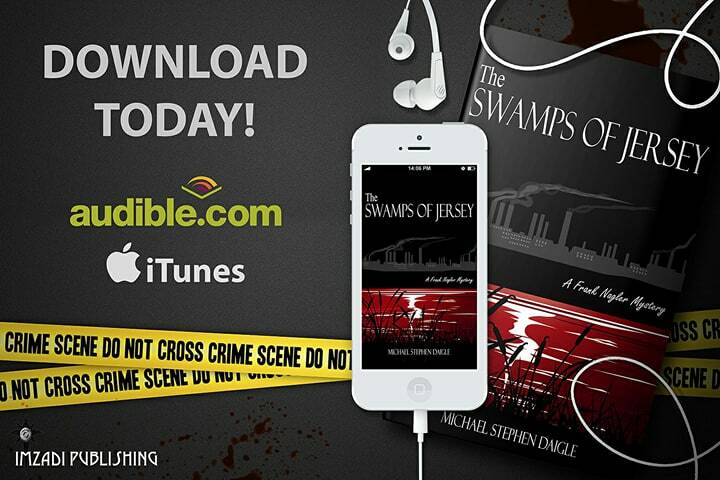 One of my favorite scenes in the first Frank Nagler Mystery, 2014’s THE SWAMPS OF JERSEY, is this one with reporter Jimmy Dawson and the Ironton former mayor Howard Newton. Newton’s speech sets a tone for all the books in which the criminals justify their actions. But is also a tone familiar to our current political discussion. Did Howard Newton anticipate the Trump era. Or did he just reflect on the work he had done himself? I was thinking of this because I was listening again to Lee Alan’s wonderful audiobook reading of THE SWAMPS OF JERSEY. (Which has received 5-star ratings on Audible.com). In Lee’s reading, the characters come to life, but one that stands out is Howard Newton. If you read the short section below, take a second and add the sounds of a deep, gravelly voice to the Newton lines. It is the voice of time, the voice of self-satisfaction, the voice of Methuselah, which Lee Alan brilliantly captures. THE SCENE: (Former Ironton Mayor Howard) Newton was probably eighty-five, Dawson figured. He never told his age to anyone. His face had settled into a mass of splotches and moles that might have been cancerous. That probably accounted for the oversized Panama he always wore, that and the shades. Always shades, even indoors. The scars on his nose traced back to his boxing days when Newton was a small middleweight with an up-yours chip on his shoulder that got him into more trouble inside the ring than he ever faced outside it. Dawson always noticed Newton’s hands. The leathery brown skin was wrinkled and bulged with veins. The knuckles were broken and bent, but his nails were perfectly manicured. The index finger of his right hand curled around a fat Cuban cigar like it was a wad of hundreds. He slowly lifted the cigar. The tip glowed red as he drew air though the tobacco. The air filled with the dense aroma as a slim stream of smoke leaked from the side Newton’s mouth. The old man placed the cigar on an ashtray, stood up and put his hands in his pants pockets. “But when that something you traded wasn’t really yours, isn’t that corrupt?” Dawson asked. Newton pointed a finger at Dawson. This entry was posted in BooksNJ2017, Fiction, Greater Lehigh Valley Writer's Group, Hot in Hunterdon; Georjean Trinkle, Imzadi Publishing LLC, Michael Stephen Daigle, Sally Ember, www.michaelstephendaigle.com and tagged "A Game Called Dead", "The Swamps of Jersey" Imzadi Publishing, "The Weight of Living", "Who shot the smart guy at the blackboard? ", Anita Dugan-Moore., Audible.com, Audio books, Fiction, Frank Nagler, Independent Press Award, Michael Stephen Daigle, Morris County, New Jersey, Royal Dragonfly Book Award, Shelf Unbound Indie Book Awards. Bookmark the permalink.